Alabama, Michigan and Ontario show additional confirmations in the latest white-nose syndrome map update released on June 12th. Marshall and Limestone counties in Alabama were added as confirmed, while Colber county received a suspect tag. Michigan’s Marquette county has been upgraded to confirmed. Finally, white-nose syndrome has been confirmed in Ontario’s Thunder Bay district and found suspect in Algoma District. Produced by Lindsey Heffernan of the Pennsylvania Game Commission, the map shows the confirmed and suspected occurrences of WNS by county/district from its initial discovery in 2006 through June 12th, 2015. 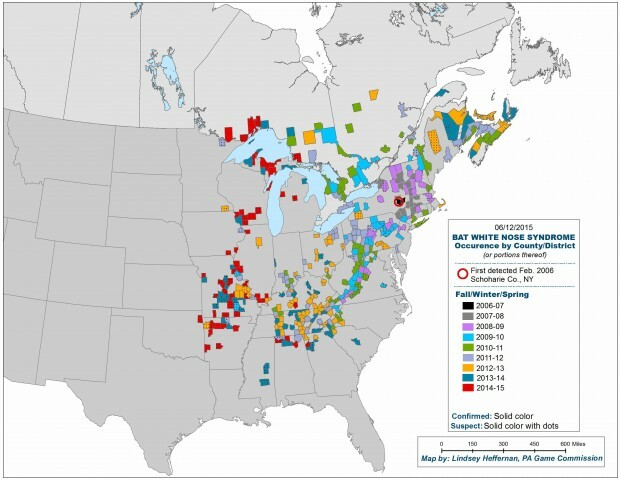 To date, WNS has been confirmed in bats in 26 states and five Canadian provinces.